The clone was surprised to see the red-jacketed man. It was like looking in a mirror, only the mirror made him look…cool. Confident. Individual. That last one is key. Too often you can get a card too early (Monolith? ), forcing you to keep it in your grip until you can play it or you lose it before it becomes relevant by taking damage. Or, are you still spending to draw to try and find what you need? This can compress four s spent drawing down to just one, and let you delay things you don't need right away. Additionally, its low influence is a bigger deal than one might think. The value of a tutor card decreases proportionately with the size of one's stack. As such, you typically want several copies of your tutors to increase the odds you get one early. 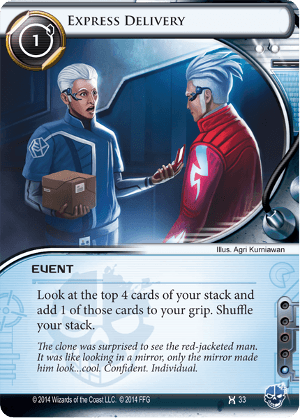 So, for Anarchs who want to look for cards that aren't viruses, or Shapers who need more than just programs, this fills the role well without bankrupting your influence budget. The second point here isn't as bad as it sounds. At least you got to put 3 of the next 4 cards you didn't want right now back in your stack somewhere else, right?